Welcome to pMap (planningMap). It currently offers this service: take the previous 28 days’ planning applications to lbg, map those that can be geo-coded (by postcode), and list those that can’t. You can read a bit more about it and check the source code below. 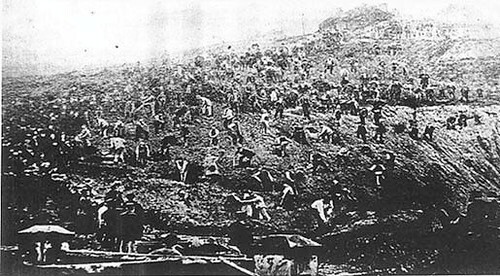 The 1876 riot that apparently saved Plumstead Common from enclosure, in the photo the people are digging up the enclosing fences (apparently). Having recently run into something of a copyright challenge it was quite nice to pick up a book that has the following announcement inside its front cover: “Please reproduce, spread, use all or part of this text (so long as it’s not for anyone’s personal profit), but we’d like to know you are doing so.” The text that’s about to be reproduced, spread and used on this site was originally put together by past-tense publishing, and investigates a number of historic events connected to the preservation of green space in South London, including the one below: a riot that prevented the enclosure of Plumstead Common. Plumstead Common belonged to the Provost and Scholars of Queens College, Oxford. Freehold tenants had enjoyed rights of cattle-grazing, and collection of gravel, turf, loam etc for centuries. It was a wild and picturesque place, loved by locals, especially kids. Troops had been allowed to exercise here in the 19th Century, leading to “the present ruinous condition of the remoter half” (WT Vincent). In 1816 two plots of land were enclosed where Blendon Road and Bramblebury Road are now. In the 1850s an area between The Slade and Chestnut Rise was sold. There were “distant rumblings” in Parish meetings, but no more. Some small plots enclosed on the fringes of the Common were given to poor widows to keep them out of the workhouse, according to Vincent (more to cut expenses to the ratepayers than from generosity possibly). From 1859 however, the College aggressively pursued a policy of excluding freeholders, asserting they were practically the owners of the waste land. Various encroachments were made, reducing the Common by a third: in 1866 the whole of Bostall Heath and Shoulder of Mutton Green were enclosed. ‘Illegal’ encroachments continued though – often facing unofficial demolition by locals. The Plumstead Vestry even passed motions in favour of the demolitions! The main targets were the property of William Tongue, a rich local builder who had bought the land here and put fences up, & his crony, magistrate Edwin Hughes, Chairman of the Vestry (later Tory MP for Woolwich). Hughes was said to have “had the key to the Borough in his pocket” -a very powerful man locally. He had bought land off Tongue to add to his garden. Tongue had already been the focus for trouble in 1866 over his enclosing ways. On a Saturday in May 1870, “a number of the lower class, who were resolved to test their rights” demolished fences and carried off the wood. “A party of women, armed with saws and hatchets, first commenced operations by sawing down a fence enclosing a meadow adjoining the residence of Mr Hughes…” Fences belonging to William Tongue were pulled down. There was talk of pulling down Hughes’ house as well. Hughes called the coppers, and some nickings followed. The next day 100s of people gathered and attacked fences put up by a Mr Jeans. When the bobbies arrived many vandals took refuge in the local pubs. In 1876, Queens College decided to lease the greater part of the common permanently to the army for extensions to the Woolwich Barracks/parade grounds. Local people, including many workers from Woolwich Dockyard, objected to the plans; notices appeared around the town in late June calling for a demonstration. The main organiser of the demo was John de Morgan, an Irish republican & agitator, who had been involved in struggles against enclosures in Wimbledon (in 1875) & Hackney. De Morgan seems to have been a charismatic (or self-publicising) and provocative figure, a freelance editor, orator & teacher, who had been driven out of Ireland for trying to start a Cork branch of the International Workingmens Association (the First International). He had long been a Secularist and Republican, but fell out with some radicals and other Secularists. He had founded a Commons Protection League. 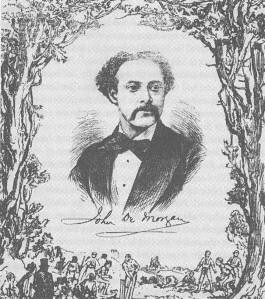 Hughes put pressure on, and John de Morgan and several other organisers were charged with incitement to riot (although de Morgan had not even been present after the July 1st events). There was clear disagreement locally over methods of saving the Common: obviously the more respectable campaigners plumping for legal means and disapproving of the rioting. Local secularist Robert Forder (another defendant in the Riot trial) also bitterly criticised De Morgan, accusing him of pocketing defence funds. He had previous issues with De Morgan from the Irishman’s split with Secularist leader Charles Bradlaugh, who Forder supported. Rob Allen in his “Battle for Plumstead Common” reckons that the local structures of power were undergoing change, and that the struggle over the Common was also a focus for class resentment and other disputes. However, local gentry also opposed the enclosures (while not supporting the rioting) for their own reasons, it was not simply a division along class lines. This can usually be found in many of the anti-enclosure movements mentioned here: they were rarely unified in tactics, or even in their motives for opposition. It’s not entirely certain what it is about Adair House (opposite the Herbert Pavillions) that makes it so popular with potential Free Schools, but not only are Shooters Hill Primary School of Arts interested, but as of this May they have a competitor in the shape of South London Free School. The executive head of the former indicated recently that they were no longer considering that site, and are now looking elsewhere for a home, so it remains to be seen how the South London Free School will fare in their ambitions to move in…their website has been quiet since May, so perhaps that scheme has gone the way of the fairies? In any case, Adair House is currently empty, having previously been a hostel, and is owned by the council. If you’re looking for something to do tomorrow, there may still be a chance to see the Secret Market, a play put on by Greenwich Theatre in Oxleas Woods. Allocating free tickets significantly reduced the scope of the production (no effects, no musicians, minimal scenery and props), but the production nonetheless comes close to filling the large shoes left vacant by London Bubble, who appear to have been a casualty of the cuts in the Arts Council portfolio, yet have become much loved for turning South East London’s green spaces into a roving auditorium. One good thing about the show is that incorporates the castle, which it is pleasing to report has recently moved a step closer to being re-opened to the public. Whilst it may still be a short while before the restoration begins in earnest, it’s still encouraging to hear on the grapevine that things are coming along, and the trust, council, and heritage lottery fund are working together towards one goal. The your paintings archive, which is bringing together digital photos of the entire national collection includes one of Shooters Hill. At a guess it was painted from the viewpoint of the Tarn in Eltham, or more likely the River Quaggy. Oxleas Meadow is clearly visible, and the hilltop appears more prominently than it does today, presumably due to the deforestation and gravel quarrying that has taken place since. Originally, the crest of the hill lay where the flats in the Cleanthus Road estate back on to Eaglesfield Park, which is itself now the highest point on the hill. If by some stroke of luck you find yourself near Glasgow Museums, why not pop in and see if they have it on display? Today a campaigning organisation called Living Streets sent in an email asking for the site to draw attention to the problems that can occur when useful community services are replaced with ones that are arguably less so. Recently during a discussion on the 853blog about the future of Woolwich, the topic of the conversion of the Woolwich Equitable building (built in 1935) into a Bookies shop led to the revelation that Banks and Bookies fall into the same class with regard to planning, making it relatively easy for Bookies to move in to High Street locations. This may not immediately seem like such a threat to Woolwich, but in Deptford bookiefication has become a phenomenon, and at the last count it was observed that their high street had eight bookies. At a time when Woolwich is rediscovering its sense of civic pride, it could do well to avoid a similar invasion, although the Powis street pedestrian precinct is currently bookie free. The campaign is promoting a greater say for communities in how changes in the use of public buildings are agreed, and in particular they are hoping to persuade the Secretary of State for Communities to reconsider proposals to further reduce the protections offered by national planning guidelines. As an aside, the proposed changes will also relax planning requirements for things such as preserving historical features, conducting archeological surveys, and protecting views – which is possibly going to be an issue when Furze Lodge is extended upwards. The campaign is called the Local Joke, and adds to ongoing work on pedestrian safety carried out by Living Streets. Over the last two years that this site has been going, some useful and/or interesting maps have been added to the archives, unfortunately the ones which are just about to be added don’t really say anything in particular about the hill, although as a follow-up from the google based maps that went up a while ago, it’s a further method for ploughing through census data which might eventually reveal something, possibly. Making ward maps can be done within-borough using ons and nomis, but because Shooters Hil is a frontier zone on the London Kent border, it’s worth considering similarities/differences with nearby Bexley wards too, with East Wickham being our nearest neighbour. Most out-of-the-box mapping programs don’t seem to be able to do this, concentrating instead on showing what’s happening within each Borough (presumably for strategic reasons). However, sometimes things don’t really work at the borough level, for instance although Shooters Hill regularly has the lowest crime rate in Greenwich (sometimes coming second to Coldharbour), the levels reported are roughly equivalent to, or even slightly more than those in nearby Bexley wards. So there is a reason for comparing wards in this way. The maps shown below highlight gender population divisions during the stages of life from the age of 0–99, without really differentiating Shooters Hill from its neighbours in any meaningful way. What the maps do show are the wider trends, such as that in the first 20 years of life there tend to be more slightly more boys than girls (especially in Eltham North), and that subsequently this difference reverses. This could mean that after 20, more girls move into this part of the world, more boys leave, or perhaps that more girls return their census forms. Above the age of 70 women seriously begin to outnumber men, and this is an indication of gender differences in longevity. Perhaps as a result of this, the overall figures show that there are slightly more women than men in this whole area, with about 3% in it (at most). Interestingly, Eltham North stands narrowly apart on this measure, and this is possibly due to the slightly greater percentage of boys in the early years. The colour scaling on the maps does tend to make differences appear quite strong, even when they’re not, and the gender divide is essentially the same everywhere — also the colour scaling is different on each map, making it harder to compare them to each other. By looking at correlations, the overall pattern in Shooters Hill is most like that of Kidbrooke and Hornfair, and least like that of Woolwich Common, although correlations are all very strong, and differences are negligible. To sum up, gender differences do not show meaningful ward differences, with the most apparent difference being that Eltham North is a tiny bit less feminine than the other wards due to its concentration of young boys. Oh well, it was worth a try, there are after all over 100 more census measures to go through, by which time the new census will have come out (next summer), and it can start all over again…not really, the site hasn’t done much with local history for a while, and some readers were promised more on the woods Vs motorway story a long time ago, so the census can wait a bit for now. This month, the local podcast In The Meantime, which is recorded at the Meridian Radio studio in Queen Elizabeth Hospital, features an interview with Mary Pfeiffer, the executive head of the of the soon to be Shooters Hill Primary School Of Arts. It’s far more in depth than any of the previous coverage seen in the newsshopper and mercury, and the educational philosophy of the school is discussed at length, which includes ‘creating the best business leaders’ and a commitment to ‘healthy competition’ in education. It was also revealed that Adair House, which is opposite the old Royal Herbert Hospital, is no longer going to be the site of the new school, although it wasn’t made entirely clear where, or even if, the new school has a home as yet. Showing a neat sense of balance, the show also includes an interview with a head from the comprehensive system, Michael Murphy, the head of the newly built Crown Woods College. Many children from the local area go to Crown Woods, and it will be interesting to see how the ‘school of schools’ theory works out for the students who are joining up now. The head has plans to pave the future careers of all students from Trades to Oxbridge destinations in a non-elitist, comprehensive way, whilst also retaining community links to the lea…which sounds like a principled ambition, but will he persuade local kids who might otherwise commute to Bexley grammar schools to stay in the local area, and will the smaller size of each school (450 per school) help? The London Bubble Theatre Company have in previous years offered show after show of hilarious and inventive twilight performances that promenade around Oxleas Woods, however this summer they are going to be noticeably absent, which is a terrible shame…but these are hard times after all, and so on and so forth…anyway, live performance fans fret not, because Greenwich Theatre are going to be bringing their own outdoor show to the woods in a couple of weeks time! Greenwich Theatre have got some form in the outdoor performance department, having recently helped to stage the hugely entertaining (if slightly under promoted) Greenwich World Cultural Festival, featuring the delights of Woolwich’s own Aircraft Circus, Greenwich’s Taiko Meantime Jumping Dragon, Zil’OKa” (a French Caribbean performance), Bhangra, the Lindy Hop, Ballroom, Steel Drumming, and Juggling, so whilst this may not be a like-for-like replacement for the way London Bubble use the change from day to night to make their shows so special, it should still be skilfully pulled off, if not amazing. 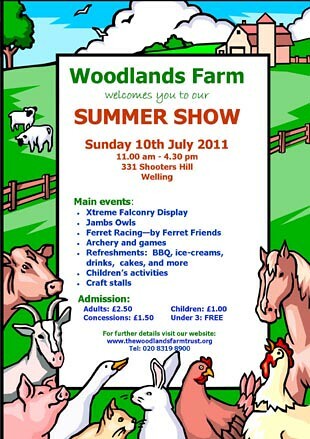 Following the success of The Visit at Charlton House in 2009 and The Finders at Well Hall Pleasaunce last year, we are thrilled to invite you to our latest free outdoor summer show, which this year takes us to Oxleas Wood for The Secret Market. The Secret Market follows our previous shows in uncovering a magical world in one of Greenwich’s most celebrated outdoor locations. Oxleas Wood itself dates back over 8000 years, and at its heart stands the impressive, gothic Severndroog Castle. It is here that we will meet the salesmen of the secret market, foraging for their wares. Ever moving, never sleeping, all they really want is a rest, but will the terrible queen who set them in motion ever let them be … ? The family production will be directed by Amelia Bird, artistic director of Gomito Productions and director of last year’s production of The Finders – so audiences can expect a healthy dose of comedy, puppetry, magic and music. The show will lead you on a journey through the woods, finishing at the castle. All tickets are free but we have strict limitations on audience size, so please book in advance by calling Greenwich Theatre on 02088584447 or visiting the box office. Tickets are not available online. certain areas of the wood and certain sections of the route are relatively steep, and wheelchair users and those with pushchairs might experience some difficulties. the show will go ahead regardless of weather conditions, so please dress accordingly. there is limited parking available at Oxleas Cafe. Alternatively, buses servicing shooters Hill Road are numbers 89, 486 and 244.
the production will depart from the meeting place promptly, so latecomers may struggle to find the action and therefore may miss out altogether. Please arrange to arrive 10 minutes before the show is scheduled to start. Thanks to stu for finding this. Part II of IV in the farm’s annual list of events; the summer show being the biggest, and the one where the large field is opened up and decked out with hay bales.